Twitter also pushed out an update for their users. This time twitter introduced old tweets. 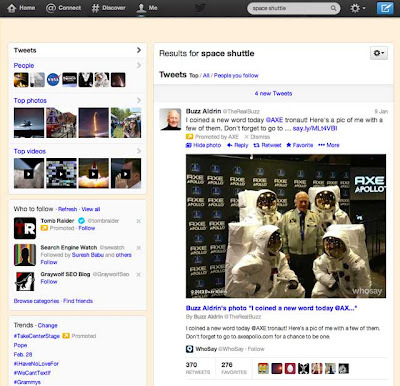 Now everyone can see their older tweets, when relevant, in their search results. Twitter said that it had “developed a way to include older tweets.” They use engagement metrics such as "favorites, re-tweets and clicks" in their algorithms "to find out which Tweets to show." For Instance, Yesterday I had searched for [space shuttle] in Twitter and this tweet from a while back displayed up at number one spot. Is it relevant? I don’t see so that is the prominent challenge Twitter needs to settle down.